Houston is the fourth most populous city in the United States and is located southeast of the state of Texas, near the Gulf of Mexico. This Texas metropolis enjoys tourist attractions such as the Space Center, home of US space missions, the Houston Galleria Mall, the Museum District and the lively nightlife in Montrose. Houston enjoys a subtropical climate, so the recommended months to visit the city are May and September. During the summer months, temperatures of over 90ºF (32°C) are common, while in mild winter, the temperatures drop to 61ºF (16°C). The transportation system of Houston consists of light rail (METRORail) and Metro buses, with a variety of stations throughout the city. Houston is a city of epic proportions. If your visit to Houston is solely to visit the NASA Space Center, you can choose to stay in its surroundings See accommodation near Houston Space Center. Areas such as Downtown Houston and Galleria are recommended when deciding where to stay in Houston, as they have hotels that suit the purpose of travel, budget and interests (See accommodation in Galleria | See hotels in Downtown Houston. The best hotels to stay in Houston, Texas. Hostels and cheap stays in Houston. Looking for independence? Book an apartment in Houston. Guest houses, pensions and B&B in Houston. The Galleria Houston is the largest shopping center in Texas. With around 375 stores, 30 restaurants, two hotels, and an ice skating rink. It is located at 5085 Westheimer Road. 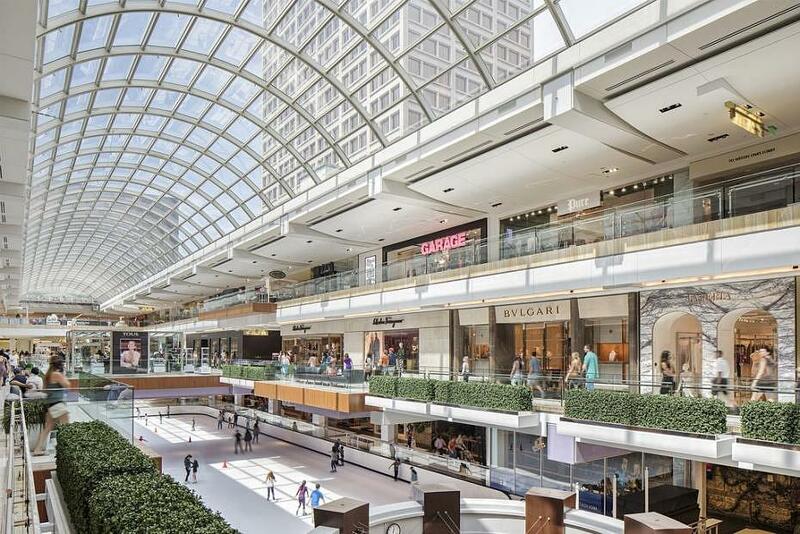 Galleria Houston is located in a central and exclusive area of ​Uptown Houston, surrounded by shops, restaurants, and hotels for comfortable accommodation. Staying in this area allows you to visit the shopping center and high fashion shops of recognized designers such as Louis Vuitton, Jimmy Choo or Ralph Lauren. It also has large department stores like Macy’s. Galleria Houston stands out as the best area to stay in Houston, due to its exclusive location, its variety of shops, bustling nightlife and restaurants. 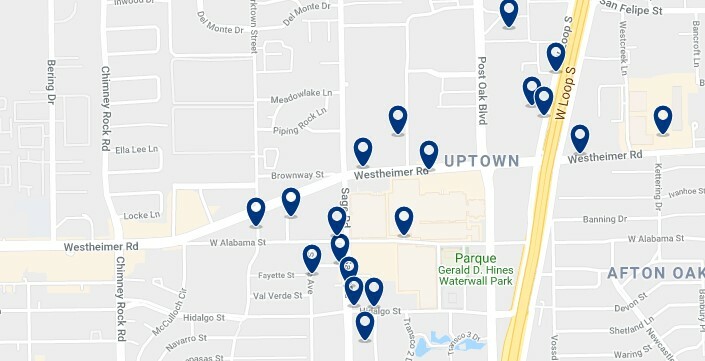 This area is connected to the rest of the city through the stations offered by the bus system in Westheimer and Hidalgo streets. Hyatt Regency Houston Galleria is located 300 meters from The Galleria Shopping Center, and it has a sun terrace and an outdoor pool. The property houses a restaurant. It also has valet parking and free WiFi in all facilities. – from US$174. Comfort Suites Houston Galleria is just a 6-minute drive from the Galleria Mall. It offers free Wi-Fi in all of its suites, an outdoor pool and a hot tub. A cooked buffet breakfast is served daily. – from US$79. Westin Galleria has a pool and connects directly with the Houston Galleria Mall. It is close to many shops and places to eat. The rooms at the Westin Galleria have a coffee machine and minibar – from US$174. Downtown Houston stands out for hosting the majority of Houston skyscrapers, mostly offices. Given its central location at the confluence of Interstate 10 and Interstate 45, it is another of the best areas to stay in Houston. Among the attractions in Downtown Houston are the Alley Theater, and the imposing architectural works such as the One Shell Plaza and the JPMorgan Chase tower, one of the tallest buildings west of the Mississippi River. This area has bus lines and 3 METRORail lines available. Downtown Houston is home to the Houston Tunnel system, which connects buildings and offices to other downtown areas. Along the tunnel there are a variety of restaurants, cafes, dry cleaners, beauty salons, craft shops and other places. 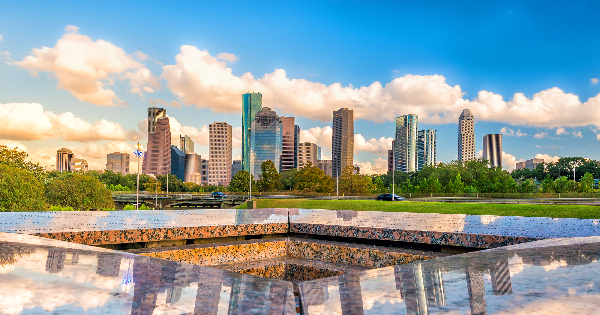 Downtown Houston has high-quality accommodation, from mid-range hotels to very luxurious ones that offer stunning views of the area’s skyline. Downtown Houston is the best area to stay in Houston for business, and the best neighborhood to stay in Houston without a car. Hampton Inn Houston Downtow is located in Houston, 300 meters from Discovery Green Park, it features a fitness center, a shared lounge and a bar. This 3-star hotel has a 24-hour reception. – from US$134. Stay Alfred on San Jacinto Street offers accommodation with free Wi-Fi in downtown Houston, a 7-minute walk from the Toyota Center. The accommodations are air-conditioned and have a fully equipped kitchen. There is a dishwasher and coffee machine. – from US$79. Apple Theory Downtown Houston offers accommodation with a flat-screen TV 7 minutes’ walk from the Toyota Center in downtown Houston. There is free WiFi. The accommodations offer views of the city and include a washing machine and an equipped kitchen. – from US$139. Westin Galleria is located in downtown Houston, it offers lodging and communicates with the George R. Brown Convention Center via a covered airlift. It is a short walk to several famous places of interest. – from US$204. Midtown is an urban area located in the south of Downtown Houston, next to The Museum Park, the Montrose neighborhood, East Downtown, Third Ward and the Museum District. Midtown has three METRORail stations: Wheeler, Ensemble / HCC, and McGowen. This area is famous for having artistic complexes such as Midtown Art & amp; Theater Center Houston (MATCH) located at the intersection of Main and Holman streets, where several visual and performing arts groups meet. Other highlights are the Buffalo Soldiers Museum and small parks such as Baldwin Park and Bagby Park, where you can enjoy the day and spend some quality time with family. North of Midtown has a lively nightlife, with a variety of bars and karaokes, informal fast food places, and the most sophisticated restaurants. Modern B & B is located just 8 km from downtown Houston. It serves an ecological gourmet breakfast and offers private rooms. – from US$104. 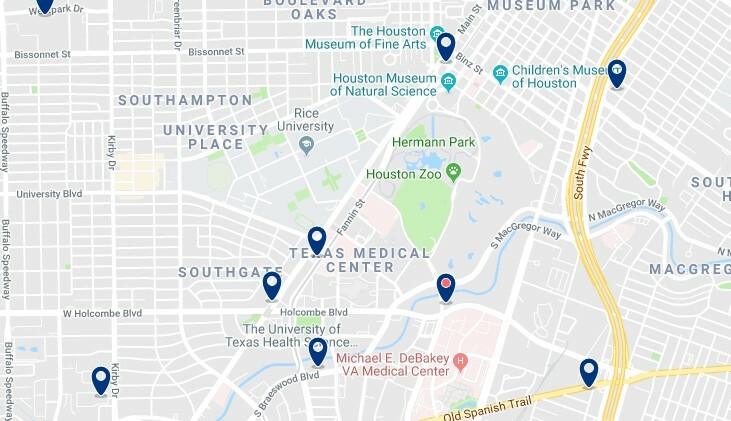 The Museum District is located near Texas Medical Center and Rice University south of Houston. Within this group, there are 19 museums which can be accessed through METRORail. It is one of the best-known cultural districts in the United States. Here, you will find the Museum of Fine Arts, the Holocaust Museum, the Museum of Natural Sciences, the Children’s Museum and other more curious ones such as the Health Museum and the National Museum of Funeral History. 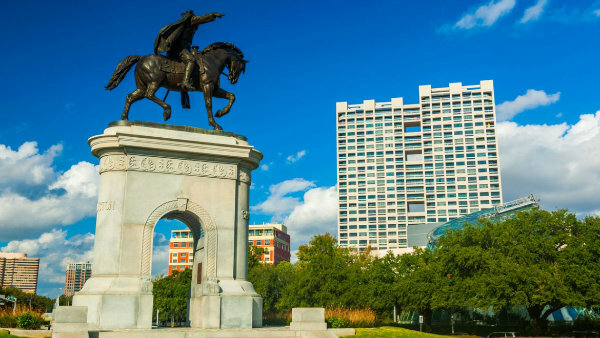 This area includes natural attractions such as Hermann Park, an amusement park located to the south of the district, Peggy Park and the Houston Zoo. The Museum District has the Museum District and the Hermann Park / Rice U stations of the METRORail to move to other areas. This is one of the best areas to stay in Houston because of its a more tranquil and historic environment. However, for its few restaurants and bars, it does not have a nightlife like other areas of Houston. Houston Towers is located 1.4 km from Houston Museum of Natural Science, it offers free WiFi and views of the pool. The accommodation has a hot tub. – from US$124. Northwest Houston is known as a residential area and leisure center for tourists. Some popular activities in this area are attending the Terry Hershey Park, the Karts circuit, going to the cinema or visiting the small shopping centers and their stores. It is recommended to stay in this area due to the tranquility it offers. It also has some small parks, and it serves as accommodation for those who want to escape from the bustle of the big city. Northwest Houston has a wide range of accommodation and some of the cheapest hotels in Houston. Best Western Plus Northwest Inn and Suites Houston is located just 4 km from Northwest Mall, it offers an outdoor pool with a hot tub, a 24-hour fitness center and traditional rooms with free Wi-Fi. – from US$64. Moonlight Inn & Suites it offers free Wi-Fi and air-conditioned rooms in Houston. The property is 12 km from the city center. 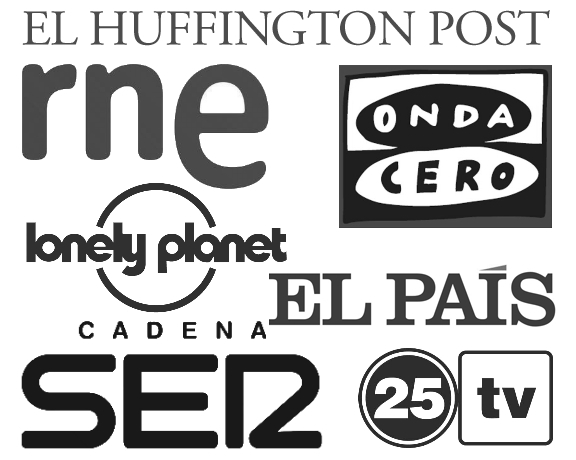 – from US$49. |ES| Dónde dormir en Houston.